Curved vs Flat Monitor for Gaming - Which One is Worth to Buy? 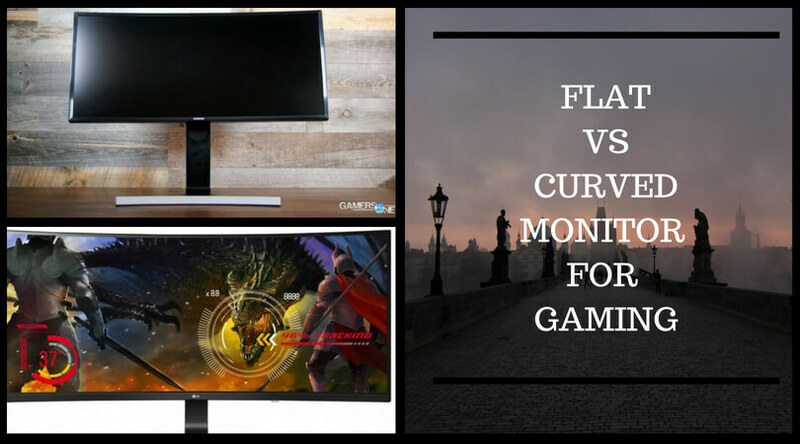 Curved vs Flat Monitor for Gaming – Which One is Worth to Buy? The gaming industry has grown manifold over the years and it still is getting more people, selling more products, using more money day by day. The entertainment provided by gaming is so great that people actually spend hours and hours on them. Games have also has become advanced and sophisticated that most games now require special graphics cards and custom computers to play smoothly. People are also willing to pay for these gadgets. Monitors are an integral part of any gaming setup as it is what actually shows the game to the user. It is the primary output device from the game to the user. It is thus necessary to have a high end monitor for your setup. Curved monitor technology came up recently and people have been in doubt about buying them for so long. This article is thus a comparison of curved monitor vs flat monitor for Gaming. Flat monitors are the conventional ones that people have been using for many years to build computers. The technology kept improving and the pixel density kept increasing. There are some high end monitors currently in the market that can take the breath away from users because of the clarity of the visuals and the colors it can produce. Worth the cost: The price of monitors have come down due to the improvements in technology and companies has started to price their monitors at reasonable prices. Easier service: Flat monitors have been around for enough time that servicing them are easier and cheaper than servicing curved monitors. Curved monitor technology came out recently and it had a certain wow factor which made them very popular. Everyone started ditching the old flat screens and getting new curved ones. That is until people started doubting whether they are worth the money. This is when the question “curved monitor vs flat for gaming?” started arising in the minds of gamers. Lifelike immersive visuals: Because of the curving technology, the visuals in the games feel more like the real life. The curved edges give the images a bit of depth and this causes this. A Wider field of view on First Person Shooting games: Thanks to the curved edges and an ultra-wide 21:9 aspect ratio, while playing FPS games such as battlefield, users can an enjoy a wider field of view in front of them. This gives them an advantage in the game over other users. Costly: There is a clear difference between the prices of both kinds of monitors. The Curved monitors used for gaming has higher prices compared to flat ones. If you are on a budget build, this can create a problem. Go with curved monitors only if you have good deep pockets. Avoid 16:9 monitors: A curved gaming monitor with a standard 16:9 aspect ratio will neither give real life nor a wider field of view. 21:9 monitors must be purchased which are costlier. Required viewing angle: Because the edges are curved there is an ideal viewing position to look at the monitor. This is directly in front of the center of the monitor. This can become a burden at times. There you go! This post was a performance comparison between the curved vs flat monitors for gaming purposes. We have laid out all the points now it is up to you to choose which one you want to go for.